Father’s Day is fast approaching. Do you have something special in mind for Dad this Sunday, June 17th? If not, don’t fret. 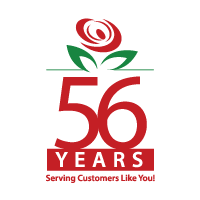 You can still contact us here at Brant Florist and we’ll help you select a bouquet of beautiful flowers just perfect for Dad. Flowers, you say? Well yes, we’ve been in the business a very long time and we’ve yet to meet a man who hasn’t been thrilled to receive our flowers! You’ll knock Dad’s socks off when he opens the door to a bunch of blooms selected especially for him. So go ahead, order flowers for Dad and keep these gift options in mind. There are lots of different choices. Match the personality of your Dad to the flower design and you are certain to hit a home run! 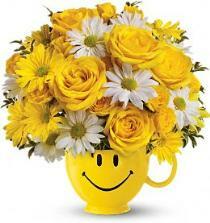 Men typically prefer flowers in strong colors so consider flowers in red, orange and vibrant yellow. For the fun-loving, easy going Dad, consider our most popular Father’s Day themed bouquets for 2012, the King of the Road Bouquet and the Blazing Trails Bouquet. 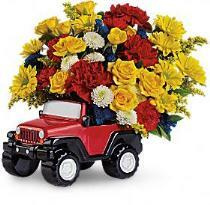 Both feature brightly colored blooms in a ceramic replica Jeep Wrangler. Once the flowers have been enjoyed, Dad will have his playful ceramic keepsake Jeep on his desk for years to come. Another fun choice is our top selling Be Happy Smile Mug, it’s bright and cheerful and it’s certain to get a chuckle out of Dad on Father’s Day. If Dad prefers clean lines, then a potted orchid may be the simple and sophisticated bloom to go with. 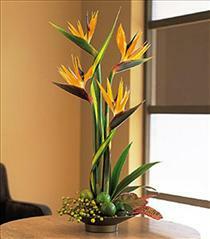 Equally striking is our Limes and Birds tropical arrangement which provides a masculine feel achieved by the strong lines of the birds of paradise. Planter baskets are another welcome gift idea for any Dad with a green thumb. Planter baskets are long lasting. They clean the air and are certain to look amazing in Dad’s office. Another highly popular gift idea for Father’s day is our fabulous gift baskets. Select a gourmet gift basket filled with chocolates or fruit or a mix of items. 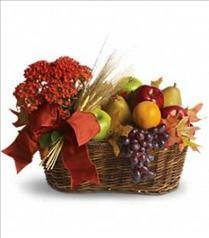 May we suggest a plant and treat combinations basket? What could be better….a plant to keep and treats to eat!